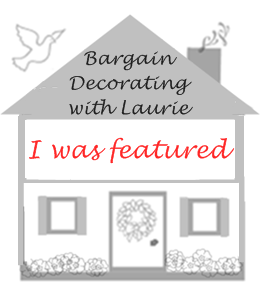 BARGAIN DECORATING WITH LAURIE: NO TRICKS - BUT SOME GREAT TREATS! NO TRICKS - BUT SOME GREAT TREATS! 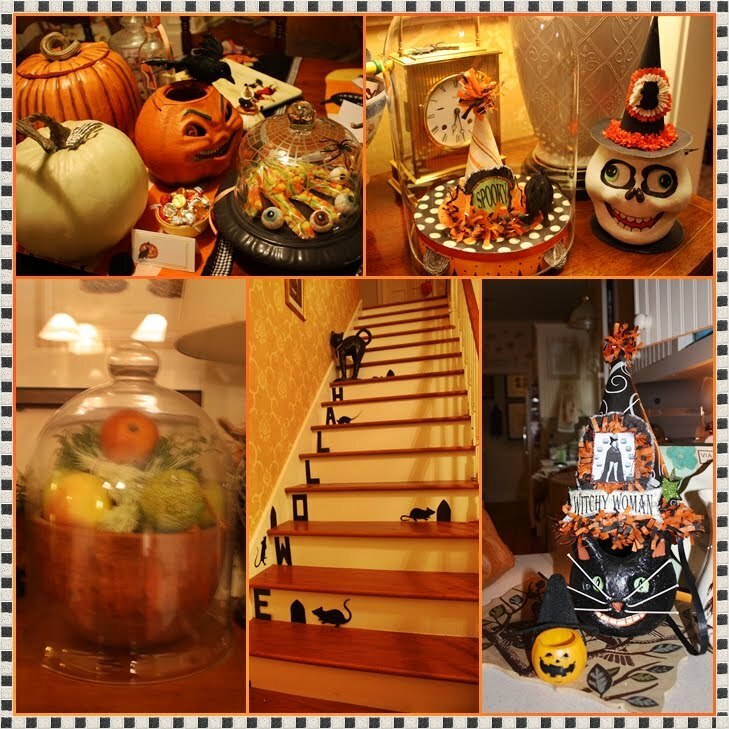 My friend, Susie, is a Halloween decorator extraordinaire. Going to Susie's home at any time of the year is a real treat, but it is especially fun to visit Susie during the Halloween season. 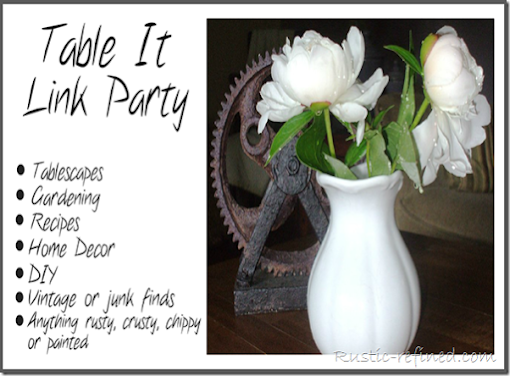 Today I'm sharing bits of her decor. 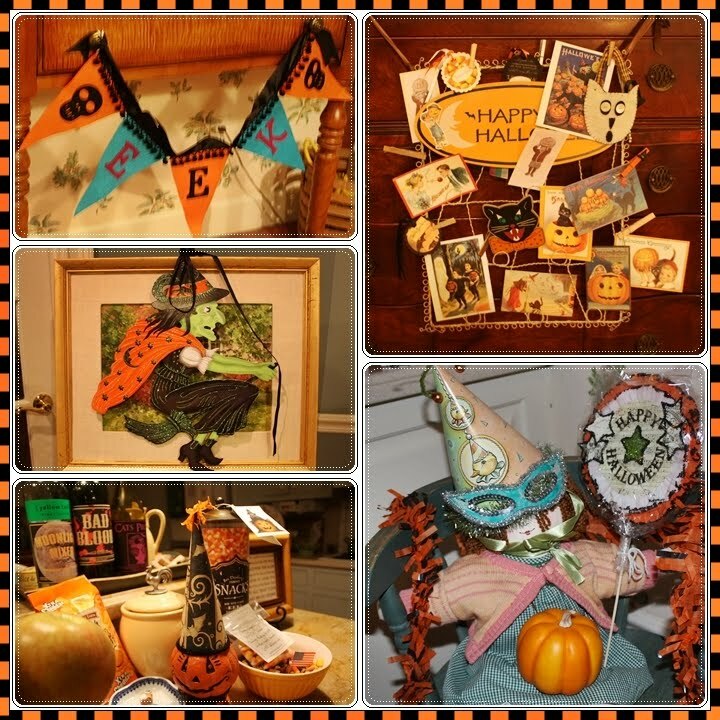 On Monday, I will be sharing bits of my Halloween decor for the Halloween Party hosted by Fiberdoodles. I want to share something that was a real treat for me! On my birthday last month, I won a prize from Bridget at My Silly Blog. Wasn't that just the sweetest thing for Bridget to pick ME on MY BIRTH DATE? It was such a fun birthday surprise. And, just look at what I won -- a Bridget original! Thank you so much Bridget. I can't wait to get it framed and hang it. 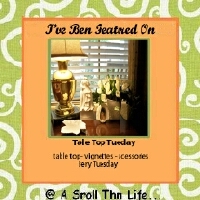 I treated myself by ordering these great plaques from the Etsy shop of Susie Harris at Bienvenue. They are a perfect fit on these two cabinet doors (which is a good thing, since I am running out of wall space!). I have a treat for you too! I guess I have to confess that I am becoming senile! So many of us began blogging at about the same time. I have been visiting bloggers who are celebrating their one year anniversaries, and I've been thinking that it was amazing that they had been blogging for a year. This morning, I realized that my first post was on October 11, 2008!!! So, I have been blogging for more than a year, and in my senility, I let the date pass by! You know how time flies when you're having fun. I, like all of you other bloggers, never expected blogging to be so much fun. I know that I have the nicest blog visitors anywhere, and I know I would never have blogged for a year had it not been for all of you. I had decided that one thing I like about blogging is that it keeps my mind active. I'm always on the lookout for a photo op for my blog, which has made me so much more aware of my surroundings. The blogs I visit have such wonderful ideas and inspiration. I learn so much from all of you bloggers, and I am so inspired by all of you. Apparently, it hasn't kept me from becoming senile though, since I forgot my blog anniversary. In appreciation of all of you, who have encouraged me to blog for a whole year, one person who leaves a comment on this post will receive this cake plate and server. I will be announcing the prize winner on Thursday, October 22nd (if I don't forget!). I'm sorry. The giveaway is now closed. THE WINNER HAS BEEN DRAWN! I love halloween going up the stairs! It is all fabulous! 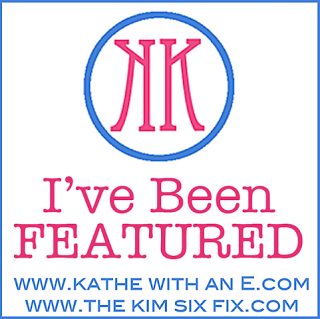 I bought one of Susie's plaques and used it in the master bedroom redo.Love it! Yours are beautiful! 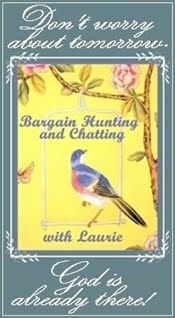 Here's to another year of bargain hunting and chatting, Laurie! Your post cracked me up. Funny! I keep getting a block, and can't think of things to post. Congrats on your one year anniversary, Laurie! I always enjoy my visits here. And hey, it's not senility making you forget.... it's only 'cause you're such a busy person. That's MY excuse, anyway, and I'm stickin' to it! Love all the halloween treats! Fun! Please put my name in the hat for the plate and server! They're lovely. Congrats on one year Laurie! Yay! We did all start about the same time didn't we. Mine's coming up as well. What a lovely flowered cake server. Her Halloween stairs are just tooooo cute! 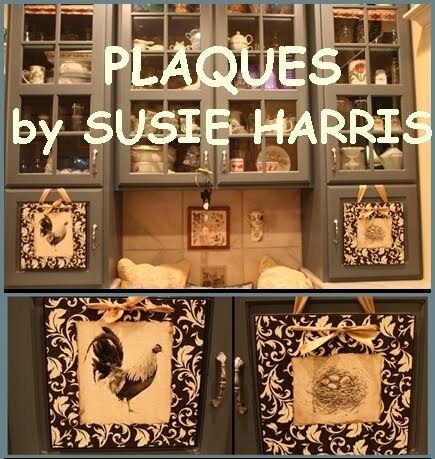 Love your pretty rooster plaques from Susie. They really look gorgeous on your piece of beautiful furniture in the kitchen. I found the scroll wreath hanger at Michaels just a few days ago so they should still have them. Let me know if they don't and I'll mail you one from here if you would like. It is unique isn't it. PS Don't forget about my giveaway coming soon!!! It's a good one! 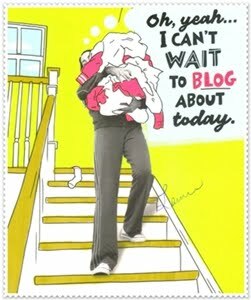 First of all happy Blogaversary! Isn't it amazing that we can come up with things for a year and then have more??? My hubs once told me he didn't think I had that much to say! Second, question...the halloween and mice on the stairs....is that vinyl? That is soooo cute. Your friend has a darling place! Hey Laurie, I loved the Halloween decorations! Happy One Year Anniversary! Would love to win the platter,oh yeh! Hi there! I just wanted to thank you from the buttom of my heart for praying for Mrs. Jane. She is doing well! Congrats girl.And you are not alone.I forget so much now,it's so frustrating. I love your friends decor.The rats and the cat on the stairs,thats hysterical. I'm sure I've been blogging a year also.I don't remember if you started first or me.Had a few other things on my mind,huh? 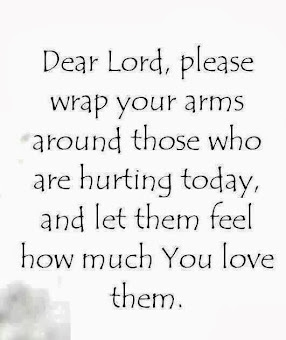 Hi Laurie, Thank you so much for your continued prayers for Kevin. We just know everything will turn out fine. It's all in God's hands. Oh, your poor poor most senile one! 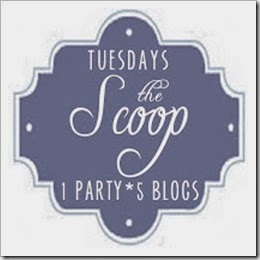 :) You've just been having so much fun, your blogaversary slipped your tiny mind! :) Happy one year anniversary! It's wonderful, isn't it? Oh, please please please Laurie, add my tiny name to the pot for that lovely cake set! It's really gorgeous! Can't believe your letting this go! But please don't change your tiny senile mind! You know I'm just kidding - I couldn't help myself because you set yourself up so well! Congratulations on your blogaversary Laurie, and on winning one of Bridget's watercolours. I love her work & I'm also the proud owner of one of her pieces. Now that my last houseguest has departed, I can play catch up with my favorite bloggers. It's close to my one year blog anniversary as well. When I began, I never ever dreamed I would stick with it. BUT, I have met so many incredible people from around the world, I could not imagine life without them. Enjoy this week and thank you for visiting me yesterday. Enjoy your blog, I'll be back to visit. please put my name in the pot. 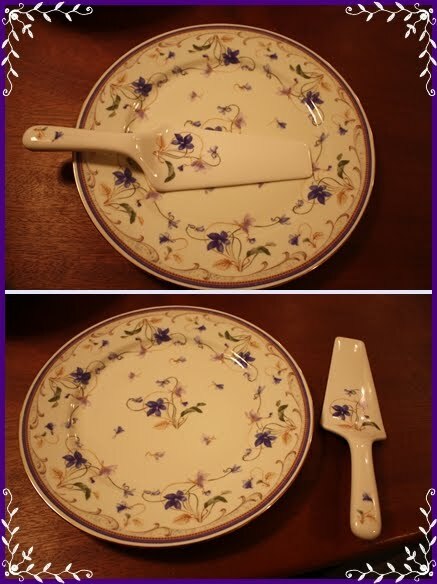 What a great giveaway, the cake server is so pretty!! Please count me in!! Btw, I having a Fall giveaway! and hope you come by!! I love Susie's work, too. I ordered a couple of things for me and some Christmas gifts..every thing I received is just perfect. Congrats on 1 year of blogging!! and thank you for this awesome giveaway!! Congrats on your one year of blogging. What a lovely giveaway. 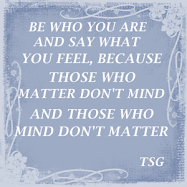 So glad to have discovered your blog, have enjoyed reading your blog. Congrats on your one year blogaversary! You always have the most fun post. Your wonderful personality just shines through! Love the plaques from Susie(she's so talented). Loved the photos of your friends Halloween decorations. Your blog is always a treat. I am crazy for mosaics myself, so I love to come here and see your creative style. Your home is amazing, and the way you stage parties. That circus one is over the top, and I loved it when you had that light up centerpiece a while back. Were you a window designer or an interior decorator? Well, have a great day. Tomorrow is Natasha Burn's ALL ABOUT ME party. She wants us to show off something that we made just for ourselves. 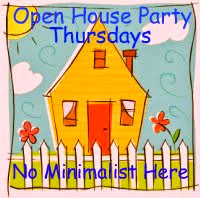 Stop by and join in the fun. 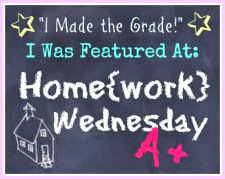 I just love your blog site. You always have soooo many little things in your pictures that it takes a quite awhile to go through your site and it is worth EVERY minute. Thanks for sharing. These Halloween decorations are just darling! Congrats on your blogaversary celebration! I love the plaques from Susie.